Lenova introduces black as a stunning new finish option for two cool faucets – also brand-new – a double dose of glamour and luxury perfect for today’s upscale kitchen. This is a matte black, sleek and quiet with a flat finish that complements both traditional and contemporary decors. Matte black is a timeless alternative to trendy metallic finishes, it’s a pleasing contrast against classic white and gray or modern colorful kitchens, and always looks fresh and new. Introducing the SK222 and the K410 (pictured) faucets. Both are crafted of the finest type 304 stainless steel with zero lead content for maximum durability and long-lasting beauty. Lenova incorporates proprietary PVD processing into its manufacturing system to create a matte finish that is amazingly durable and easy to maintain. These pull-down faucets feature a two-function sprayer and a 360° swivel spout to meet the demands of the busiest kitchens. The SK222 has a striking geometric vibe while the K410 has a gently rounded silhouette. Both are notable for their dramatic arches and side levers. 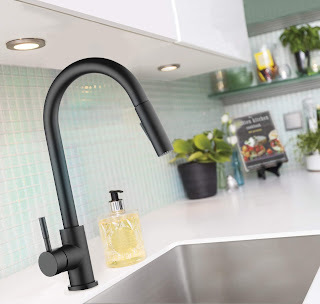 In keep with Lenova’s exacting standards, the faucets include top quality ceramic cartridges for drip-free performance and a 10-year limited lifetime warranty.